By the middle of 1963 only 21 out of the original 55 U-2’s remained, most having been lost over the years to various accidents. Mindful of the U-2’s performance degradation, brought about by heavier payloads and the inability of engine improvements to compensate, Kelly Johnson embarked upon an investigation into ways of re-establishing the aircraft’s performance. These began on 2 February 1965 and were referred to variously as the VU-2C or U-2N; in-house however, they were known as the CL-351. The emerging aircraft was one third larger than its predecessors and eventually became the U-2R. On 19 September 1966, the Air Force approved the construction of eight aircraft, placing a further order for four additional U-2Rs, four months later. Final assembly took place in Building 309/310 at Burbank, after which Article 051 (the prototype) was trucked to Edwards North Base, for its first flight, an event that took place on 28 August 1967 – at the controls was Lockheed Test Pilot, Bill Park. By February 1968, the second U-2R was dispatched to North Base, where it was received by a CIA unit desig­nated Det G. By December 1968, all twelve aircraft had been delivered and equally split between the ‘Agency’ and the Air Force. In keeping with other Air Force projects, the ‘Senior’ codename given to the U-2R programme was Senior Year. OL-20 moved in July 1970 from Bien Hoa to U-Tapao, Thailand. Here a Melpur Commit sensor and datalink from the Sperry company was integrated into a U-2R, giving rise to the Senior Book, Siglnt programme. These missions were flown mainly at night in racetrack orbits high above the Gulf of Tonkin, from where the U-2 eavesdropped on Vietnamese national and air defence communications, transmitting the data, in real time, to a ground station at Nakhon, Phanom, on the Thai border. These flights provided simultaneous communication relay facilities to other US aircraft in the region. By January 1973, operations increased to round-the-clock and OL-20 was redesignated the 99th SRS. Siglnt coverage contin­ued to improve and expand, giving rise to Senior Spear – this entailed antennas being moved from the fuselage into specially adapted pods faired into the wing. Then came Senior Stretch, where siglnt data collected by the U-2 was relayed from the ground station up to satellites and onward to the National Security Agency (NSA), Maryland. As the war in Vietnam drew to a close, followed by the inevitable cuts in defence spending, U-2s of the 100 SRW were, in July 1976, consolidated into the 1 SRW, at Beale AFB, California. fied air defence radar and communications sites by homing in on their emissions, with a long-range, high resolution radar, being developed by Hughes, known as ASARS-2 – Advanced Synthetic Aperture Radar System (ASARS-1 was deployed on the SR-71). All of this digi­tised information could then be downloaded as required. With its additional capacity, high-altitude capability and proven long loiter time, the U-2R was the natural plat­form choice in which to site all of these ‘black boxes’. Furthermore, in a move designed to shake off the ‘spy – plane’ tag once and for all, it was agreed that the aircraft would be renamed the TR-1, for Tactical Reconnaissance. But as Kelly Johnson’s successor, Ben Rich, later remarked, “The press simply called it the TR-1 spvplane instead!”. Twenty-five TR-ls were ordered in the FY 1979 budget, at a cost of about S550 million, including sensors and ground support equipment. In addition, a further ten aircraft were ordered ‘in the black’, these would retain their U-2R designation and supplement those surviving from the earlier build. The first Air Force TR-1, 80-1066, was publicly rolled out at site 7, Palmdale, on 15 July 1981 and was flown for the first time by Lockheed Test Pilot Ken Weir on 1 August. In-flight development of ASARS-2 had been conducted utilising U-2R, 68-10336 and early test results were remarkable. pinpointed immediately by triangulation. This method side-stepped the problems of emitters shutting down before the direction-finding process, conducted by Wild W’easel aircraft, could be completed. 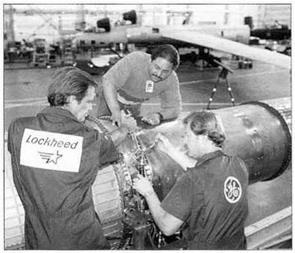 A similar system, known as the Advanced Location and Strike System (ALSS), had been installed together with datalinks on all seven remaining Air Force U-2Cs, back in 1972; however, it was plagued with problems and cancelled. The sophis­tication of PLSS brought with it similar difficulties and after a series of delays, it too was cancelled, in the late 1980s.